The most common Frequently Asked Questions about Ecuador and more. The most common Frequently Asked Questions Ecuador and more. We have gone into great detail to answer as much of those common questions as possible, which you will find divided in their corresponding categories below. Please feel free to reach us if you have any questions that remain unanswered. What should I know when visiting Ecuador? Currency: US$ American Dollars only. Travelers Checks: Not recommended, very few places cash and accept them. Electrical Outlets: 2 flat parallel blades at 110v, same as the US. Tipping is not common for locals, in medium to high end restaurants they will add 10% for services, rounding an additional 22% to your bill, including 12% of taxes. Some Hotels might also have the standard 22%. Tipping taxi drivers is not done at all, they might expect it from foreigners, but not from locals, your own discretion should dictate whether you tip them or not, a good guideline would be based on their service, if they had the taximeter on, and if you believe you were charged a fare rate – you can round up the rate. What documents should I carry with me? Carrying your original documents should only be done in the event you will be using them in that particular day, otherwise it is best if you just carry a copy of your passport and any other important documents, keeping the originals stored back at your Hotel or home stay. ATMs are easily found throughout the country in main capitals and towns, now that doesn’t necessarily mean you will be able to withdraw money at any time, some may only accept local cards and others might be out of service, you would also have to be aware of the cash limits that go from $300 to $500 per day, it is best if you don’t depend on finding an ATM. What are the main transport methods available? Main transportation methods throughout Ecuador are limited to Buses, Vehicles & Planes, there is no subway or train transportation available. In Quito there is 3 general transportation systems (Ecovia – Trole – Metrovia) all connecting you to different parts of the city, unfortunately they don’t cope well with the amount of users, especially in peak hours, it is recommended to take taxi’s whenever possible. What is the average time for domestic flights? With Ecuador been relatively small, domestic flights are no more than 45 to 50 minutes per way. Galapagos would be the exception with a 2 ½ hour flight from Quito, including a 30 minute stop in Guayaquil. How expensive is transport in Ecuador? It depends on how you intend to travel in the country or city, buses are the cheapest and the most adventurous way of getting around, the base bus fare is usually 0.25 Cents, for long distance buses – the fare is about $1 per hour of transport, Taxi’s minimum fare is $1, and long taxi drives that can take about an hour are usually $30 to $35, it is best if you negotiate the rate in advanced instead of been surprised on your way out. Finally domestic flights can range from $60 to $90 per way, they are quite frequent between main cities and are the fastest way of getting around. Should I arrive to Quito or Guayaquil? What will your first stop in the country be? Say for example you are coming to Ecuador specifically for the Galapagos only, you wouldn’t have to fly into Quito as flights to the Galapagos are connected through Guayaquil. Over 80% of tourists visiting Ecuador decide to fly in to Quito, you have a great assortment of things that can be arranged in the surroundings, and it is a great starting point. How much time prior do I have to be in the Airport? Check in time for International flights are 3 hours prior, all domestic flights are 1 hour prior, and although flights to Galapagos are considered domestic, a check in of 2 hours prior is required. What security measures can I follow? Try to keep a casual look, don’t wear to many jewelry or extravagant outfits. Most importantly don’t be too frantic about your safety and enjoy yourself, Ecuador above all is a lovely country with good hearted people, the main purpose for the above guidelines are to avoid you a bad time. Is it safe to take a taxi from the airport? Yes, Quito has a new airport with official taxis and standard rates, so you are safe to take them, the same would apply for taking a taxi in other main airports. How widespread & available is the Internet? It is quite widespread throughout the country, with the exception of remote and rural locations which is to be expected. In main cities (Quito-Guayaquil-Cuenca) you will have WiFi access in many public areas such as restaurants, bars & even in parks. 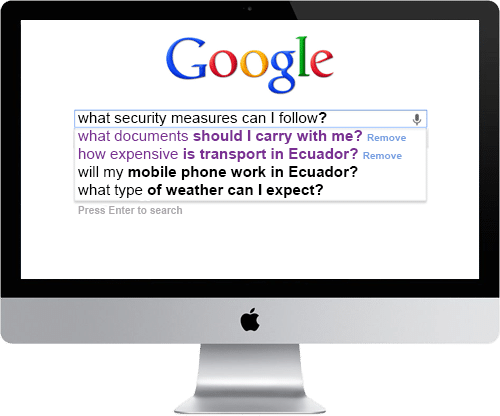 Will my mobile phone work in Ecuador? Local Mobile carriers (Movistar – Claro – Cnt) use GSM as their primary communication standard, CDMA or other standards are nonexistent in the country, if you are hoping to have international roaming with your mobile device it’s a hit and miss, as compatibility with band spectrum’s your device connects to back home might not be available in the country. Your best bet is if you have an unlocked (carrier free) mobile, buying a GSM chip is fairly inexpensive, ($6 with credit included), pop the Sim card in, and you should be good to go. As a last resort if you really need to be reachable – inexpensive mobile phones can be easily purchased as a temporary solution while you’re in the country. Most definitely, we strongly advice to purchase travel insurance for any type of tour you have in mind. It is best if you look at your options back home as purchasing travel insurance in the country is limited and will not have the same coverage or benefits you could obtain with insurance abroad. Have some questions in General? you’re almost there!